Miss Field; the brilliant; the witty; the Australia fan; has written an interesting piece this week involving calendars and cricketers not wearing very much. This got Nightwatchgirl thinking. Surely the ECB would capitalise on the England cricket team's good looks? 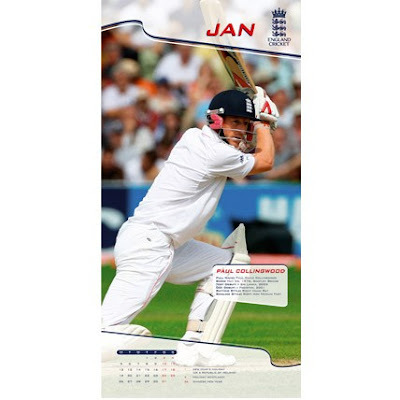 It's obvious they're short of money (else, why is NWG paying £95 a ticket for Lord's), so a calendar filled with England's finest would surely be a top seller. Imagine, Ian Bell looking all surly and sultry in to the camera, or Paul Collingwood emerging from the water like Mitchell Johnson wearing not very much. Nightwatchgirl says yes please (and also realises sarcasm is hard to communicate by words alone). So, Nightwatchgirl went looking. And there she found it. The ECB calendar. But were there any pictures of half dressed cricketers? Instead, what's the best Team England can provide? What every cricket fan wants. 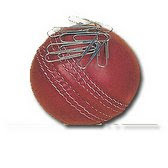 A magnetised cricket ball that you can stick your paper clips too. How useful. England, you must do better. Your country needs you. Hampshire did a naked calendar - didn't see the real thing but the photos that made it to the news were rather rubbish - v scantily clad cricketers posing on pitch - they looked right pillocks. I think this sort of thing is best left to the Aussies - Mitchell Johnsone by the sea - much more promising! Hmmm after some research - Shane Watson in a towl - no thanks! None of our cricketers are good looking enough to handle a photo without the protection a cricket kit provides. Nightwatchgirl, we are sick and tired of your ridiculous letters. Please stop writing to us with immediate effect. i woudlnt mind that ball, cuz i have a lot paper clips lying around at office. Can That Be A Practice Match? Please?